Cardiac 3D Print Lab at Phoenix Children’s Hospital among most prolific in U.S. The majority of the 3-D printed hearts are used for children’s cases. The solution to a fraught moment in the first episode of the new CBS medical drama "Pure Genius" came from a real-world technology that has been advancing thanks in part to a collaboration between Phoenix Children’s Hospital and Arizona State University: 3-D printed hearts. At least twice a week, surgeons at the hospital use the devices as they try to save lives, according to university and hospital statistics. Surgeons use the replicas to plan the best ways to fix any number of defects, before they cut into a patient. It’s a relatively recent development. The journey to the Cardiac 3D Print Lab began in 2010 when David Frakes, an ASU engineering professor, started recruiting art majors to join the Image Processing Applications Lab. He had a hunch that art and design students would be able to see technological possibilities that medical students couldn’t. Enter Justin Ryan, then an undergraduate majoring in digital art at the Herberger Institute for Design and the Arts — who happened to have an aptitude for science. “David convinced enough people that as long as I passed my” graduate exam, “I should be admitted to the biomedical engineering graduate program,” Ryan joked. Today, Ryan, an ASU post-doctoral researcher, runs the Cardiac 3D Print Lab, leaning heavily on his background in 3D modeling for computer animation, which can be directly leveraged for 3-D medical printing. Although 3-D medical printing wasn’t new, it also wasn’t something doctors could use to save heart patients, such as patients with rare tumors, as depicted on "Pure Genius." Doctors often need a 3-D printed heart in a matter of hours, at the time the process took weeks. The turning point came in 2012 when a grant from the Phoenix Children’s Hospital Leadership Circle funded the purchase of a 3-D printer for the hospital. A heart can now be printed in nine hours or less, and more than 300 have been produced for surgical guidance, making the Cardiac 3D Print Lab at Phoenix Children’s Hospital one of the most prolific in the nation. The only others that compare are at the Mayo Clinic in Rochester, Minnesota, and Boston Children’s Hospital. The majority of 3-D hearts are used for children’s cases, but the lab also produces for adult patients at other Valley hospitals, including a 92-year-old, Ryan said. The technology isn’t limited to hearts, Ryan said. Early trials are underway that involve skin cells. Researchers are hopeful are to experiment with livers. And 3-D printed bone could be possible for cancer patients. Ryan estimates it will be about 25 years before the technology advances to the point that 3-D hearts can be transplanted into patients. But parts, such as heart valves, will be ready in the next five years. Implantable devices, including stents and clips, will likely be available sooner. In addition to 3-D hearts, the lab prints other surgical aids, including a variety of tumors. The technology, meanwhile, also helped a fictional cardiothoracic surgeon at a Silicon Valley hospital conceptualize the best course of action to save a life, merging the art of TV production with the science of high-tech medicine. The Cardiac 3D Print Lab was recently awarded a grant through the ASU Foundation’s Women & Philanthropy program. On Nov. 4, the ASU Symphony Orchestra presents "A Circle of Forces." The concert is led by director of orchestras Jeffery Meyer conducting Benjamin Britten’s evocative “Four Sea Interludes,” Prokofiev’s powerful “Symphony No. 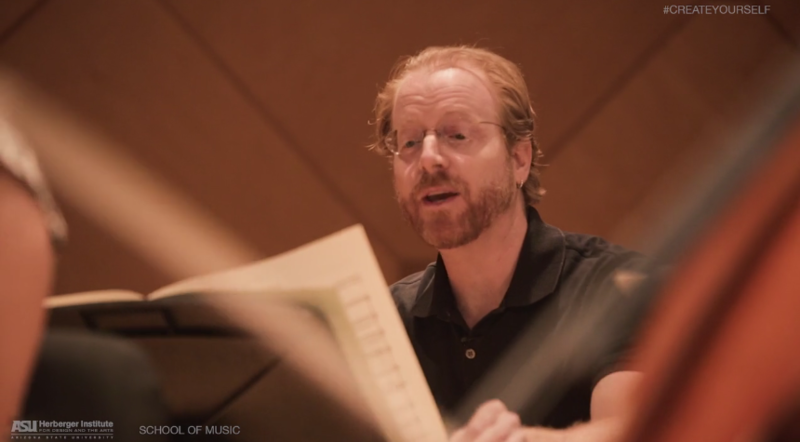 5” in honor of the composer’s 125th birthday, and the U.S. premiere of Frank Nuyts’ “Tumbleweed Concerto” for cello and orchestra featuring ASU School of Music professor of cello Thomas Landschoot. The concert is open to all, free of charge. The program Nov. 4 marks Meyer’s fourth concert in his inaugural season as the ASU School of Music director of orchestras, and if you haven’t been able to attend the previous concerts, this musical offering is definitely one not to miss. The ASU Symphony Orchestra provides an intensive orchestral experience and professional-level artistic performances to help emerging young artists develop a wide range of skills and aptitudes. Rich concert programming offers audiences and the greater arts community opportunities to engage with major works of the orchestral canon as well as cutting-edge contemporary works. In addition to conducting the ASU Symphony Orchestra, Meyer teaches the graduate orchestral conducting studio. The ASU orchestral and opera conducting studio, one of the most competitive graduate programs in the country, offers students the rare opportunity to gain a breadth of experience in both orchestral and opera conducting. Meyer’s initiative to engage Phoenix Symphony musicians to teach orchestral sectional rehearsals and the addition of the new orchestral studio class have already had an immediate positive effect on the program and are sure to create great momentum and excitement moving forward. The short video below features a day in the life of Jeffery Meyer. We hope this sparks your interest to come and hear the ASU Symphony Orchestra and support live music in Arizona. The ASU Symphony Orchestra’s performance of "A Circle of Forces" is Friday, Nov. 4, at 7:30 p.m. at ASU Gammage. Admission is free. For more information, visit asuevents.asu.edu.